In the map above, the red marker indicates the parking lot of the Bookshop and Library. Directions to Krotona by air, train or car. Visitors arriving by air may fly into Los Angeles (LAX), Burbank (BUR), or Santa Barbara (SAB) airports. Generally speaking, flights to LAX will be more frequent and less expensive. Unless you arrange for a rental car, you will need to take a shuttle, taxi or train from the airport. Please note that shuttle and train service is available only from LAX. Trains operated by Amtrak serve the Ventura train station and have service from LAX. Just as with the shuttle service, you will need to arrange a ride from the train station to Krotona. 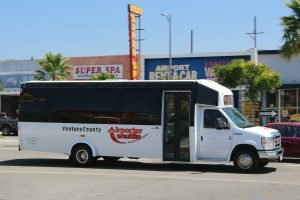 Currently, the only shuttle service coming directly to Ojai is the Roadrunner (1-800-247-7919), which offers service to and from LAX. 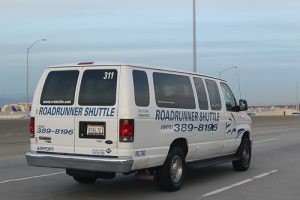 Roadrunner shuttle fares can be shared with other incoming students. An alternative service is the Ventura County Airporter (1-805-650-6600). You can book a round trip ticket online when you have booked your flight. For students registered for classes, Rochelle is available for assistance with ground travel plans. Please let her know as soon as your travel plans are confirmed. Take the Ojai/Hwy 33 exit from Hwy 101 North or South. Drive north-bound 12 miles through the small towns of Casitas Springs, Oak View, and Mira Monte. After passing Villanova School, take the next left (Krotona St on the left, Hermosa Rd on the right). Two stone pillars mark the entrance. Krotona is on Ventura Ave/Hwy 150 at the intersection of Krotona Hill / Hermosa Rd., 0.6 miles south of the “Y” (Vons shopping center). Ojai is a rural community of 8,000 cradled in an inland valley in the coastal mountains of Southern California. We are located about a 90-minute drive north of Los Angeles, and 30-minutes inland from Ventura. Private taxi and shuttle services are available directly to Ojai or to Ventura where we can arrange to meet you.